In Bali, the island’s culture has strong ties to the surrounding natural environment. The religious rituals are delivered as a give back to the ancestors and nature for the entire ceremony and life. The sacred rituals involve beautiful offerings and eye-catching cultural performances. Every art form was born as an offering to the gods and the spirits of the ancestors. 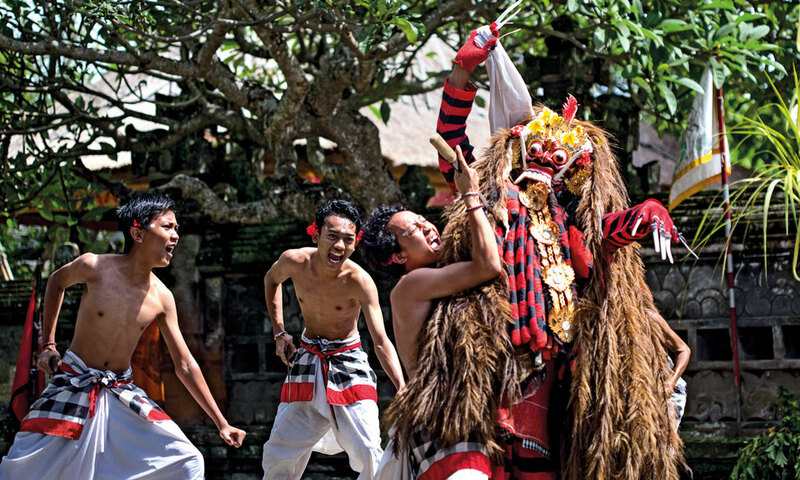 Most of the dances of Bali are inspired by the activities of nature and animals and the Mrgapati dance is one of them. Mrga means king and Pati means death. The dance routines demonstrate the movement of the king of the jungle lurking on his prey. This masculine dance is actually performed by female dancers. When they dance, their masculinity shines strongly through every firm yet beautiful movement. The costume and make up plays important roles as they strengthen the dominating male character. 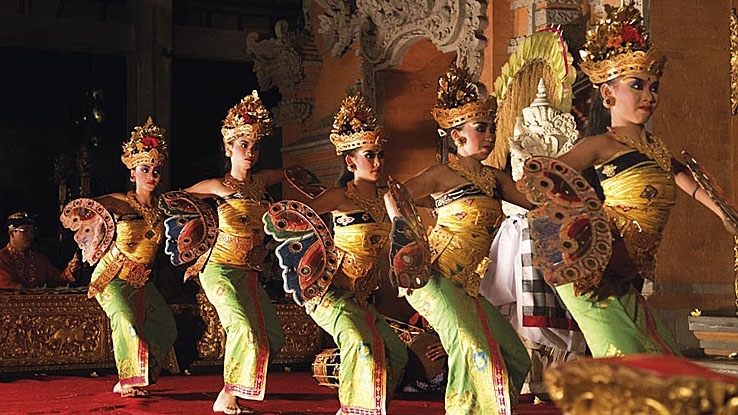 The dancers wear a wrap around sparkling gold prada – Bali’s authentic gold printed fabric covering the leg, and the torso is wrapped with long rectangular yellow cloth. They also wear badong – a necklace for men, around their neck, and udeng – the Balinese traditional head piece for men. I Nyoman Kaler is the maestro behind the creation of Mrgapati dance in 1942. To be successful in performing the dance, the dancers not only must be able to master the gestures, but also to display the soul of the story through facial expressions, eye movements and even fingers movements. The dancer should portray a lion, a king of the jungle who has power, courage, and confidence. 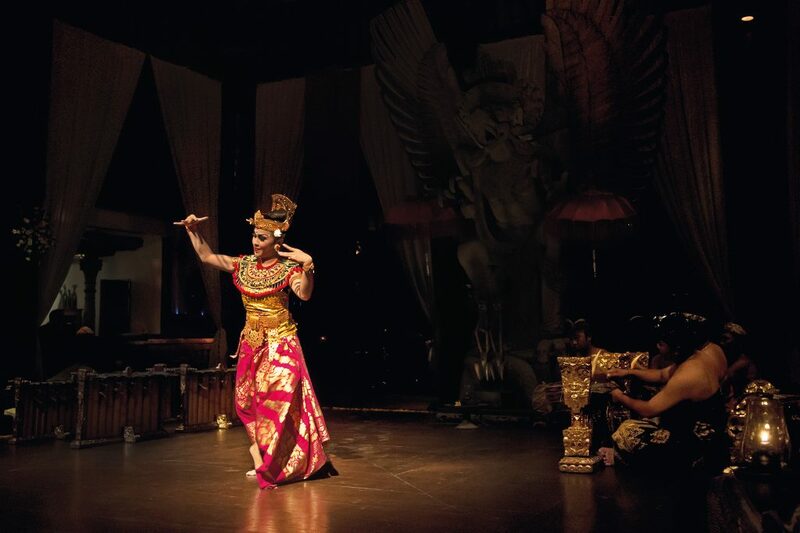 This classic bebancihan dance (bebancihan is a male dance performed by female) takes the audience to the scene where a lion is roaming around its territory and slowly approaches its targeted prey. When it misses the target, the arrogance rises and the anger powers the hunt. This dance is not only meant as entertainment, but is mostly performed during rituals for ancestors, and some say that this dance is also about the path that is taken by the spirit of the ancestors.